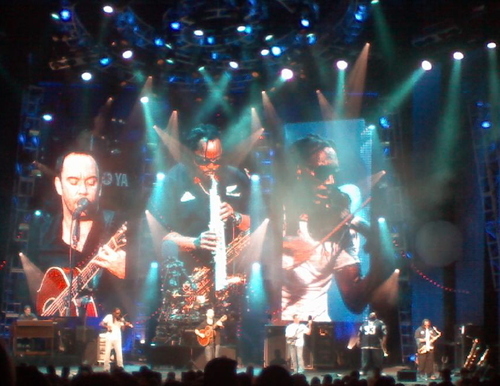 8/1: DMB @ Tweeter Center in Mansfield, Mass. 2007 Summer Tour Is Here! 5 days, 4 shows, 2 venues, 1 press pass and over $100 in gas can only mean one thing…DMB summer tour ’07 is “officially” underway! Lucky for me the guys decided to kick it off on the east coast so I can see as many shows as possible. Amazing as it may sound, in my nearly 100 DMB shows over the years, I don’t think I’ve ever made it to one that was a tour kick-off, so you can imagine how psyched I was to be at Mansfield N1 and N2. Of course Billboard didn’t “hire” me to solely cover DMB shows (though clearly I’d take that job in a heartbeat), so no press pass for me for this double-header opener. Pics may be few and FAR between (pun intended), but hopefully the review will make up for the lack of visuals. A little after 8:00 pm on Wednesday night, the lights at the Tweeter Center in Mansfield, Mass. dimmed, hoards of fans rushed to their seats and the typical mass hysteria that often welcomes DMB onto the stage erupted. Reaching for his guitar, Dave slowly gaited across the stage and carefully assessed the crowd with that signature contemplative look on his face, smiling every so often to make each person in the front few rows feel like he was looking directly at them. Though not one of the lucky front rowers for these shows, to those of you fortunate enough to be up close and personal, don’t listen to what other jealous nonbelievers around you say….YES, he was looking at YOU ;-)! I think we were all surprised when Stefan hit the opening bass notes of “Crush” to start things off. A totally unexpected, but amazing opener and the perfect introduction to a weekend that saw the band ease into their tour with a smooth, funky-jazz style and sound. The opening nights in Mansfield weren't the “craziest” shows I’ve seen, with the band launching into set lists full of high energy tunes (though there were some of those infused into the two nights…a.k.a. "Dancing Nancies," "Grey Street" and "Ants Marching," to name a few), which I think is probably par for the course at the beginning of a tour as the band is re-discovering its groove. Granted this is merely one fan’s opinion, but I thought the shows were a bit slower paced, heavier on some of the band’s darker, more easily drawn out songs that showcase not only a tremendous amount of intensity from Dave himself, but the individual talents of the rest of the band as well. 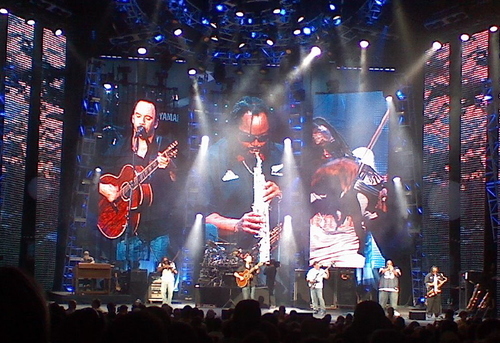 The opening night of 2007 was no less incredible than any other DMB show….and “Crush,” with it’s stretched out jam at the end and solos from violinist Boyd and sax man Leroi, totally set the stage for all that was to come for the two nights in Mass. Ending a nearly month long hiatus after their Live Earth and Chicago shows, DMB hit the stage sounding super tight and strong, both instrumentally and vocally, and above all, looked like they were having a great time rocking out with one another again. The show itself seems bigger too, with incredible lights and 3 huge screens in the back that flash real-time shots of each player during the songs. It’s not always easy to understand Dave’s mumblings into the microphone, but when he told us that he “likes his job” and hopes he’s “doing it good” we quite enthusiastically assured him his performance was up to par…..though seems more like a rhetorical question if you ask me. "Dancing Nancies” is my absolute favorite song…from DMB or anyone for that matter. To hear it 3rd song into the night…NICE! Jumping up and down like a little school girl as soon as I heard Dave play the first 2 guitar notes, I knew I was in for a great time. Dave and Boyd dueled it out between violin and guitar old-school style, with Boyd dancing and hopping around Dave while Dave, slightly hunched over his guitar, leaning into Boyd and moving his head in sync, intently stared into the violinist's sunglassed eyes and kept pace right along with him. Eventually, Boyd took off and played into the crowd as only he knows how…dancing back and forth across the edge of the stage, getting into the fans' faces and going crazy on his violin as the crowd stared up and cheered him on. He was on fire! Facing off with Stefan and then Carter, Boyd totally stole the song, as he later did with “Louisiana Bayou” and then again on “Lie In Our Graves” during N2. With Dave, Boyd and Stefan all turned in to face Carter, they played and waited for their drummer to signal the ending of the song. Watching the band members interact and play off each other is one of the most amazing things to witness at a DMB show. It’s unbelievable how in sync they are on what seem to be improv jams. It’s just a testament to how tightly and well these guys work together. "Idea of You” and “Grey Street" were two more highlights for me. I just love how “IOY” is evolving from show to show, and “Grey Street” is a high energy favorite that really gets the crowd going. I was a little disappointed that they slowed down the momentum with “Sister,” which is usually saved for a Dave solo during the encore, but it’s a sweet, lullaby-like song nonetheless. But then, the song that many of us wondered if we’d hear live after Dave showcased it at his oh-so-elite D&T Hampton’s concert reared it’s head: "#27"! Psyched about hearing some new material, the crowd went nuts when Dave introduced it: “I don’t think we’ve ever played this song before, but it’s our goal to play a whole concert of songs not on CD’s.” Note to the band: Go for it! The power of the DMB taping community is incredible, because with only one appearance of this song less than a week prior, it was obvious that many had already heard it more than once, because a good amount of us were singing along to Dave’s brooding lyrics: “I’m sick of you, and I’m sick of me. I’m sick of war, and I’m sick of peace…I’m so sick that this sickness feels like dying.” I’m really excited to see how this song takes off as the tour progresses, because even though it was the first time the whole band played it, there’s HUGE potential here for it to turn into the prize of the summer. It’s a bluesy sounding tune marked by Dave’s pensive yet sometimes disgruntled lyrics about the world at large. Continuing with the somewhat dark mood, the band moved into “Still Water>Don’t Drink The Water.” My man Xavier Rudd came out to play his didgeridoo, which added an even eerier, almost exotic feel to the heavy and relatively harder song, especially the intro, on which the crowd backed him up by clapping to the beat. Dave’s voice sounded huge and fully charged, as he belted out his lyrics with purpose and intensity…actually, I kept noting all night how great his voice sounds…really strong and fresh. Following “DDTW” with “The Maker,” another Daniel Lanois cover, seemed perfectly placed in the set list. The classic “Jimi Thing” definitely lightened things up a bit. Perhaps the best part about this song is watching each band member take center stage for some solo time, which in effect allows the song to play out for close to 20 minutes. The guys brought out Sam Kininger to join Leroi and Rashawn, an added bonus to an already incredible horn section (which really shined during this song). One of the many reasons why I think Dave is such a great front man is that he loves letting other musicians show off their talents. It’s really cool to see him gracefully move to the side of the stage and watch in admiration as the other guys do their thing. And when the music slowed down in time for Dave’s signature “Jimi Thing” skat, he turned to smooth-sounding keyboardist Butch Taylor to get things started. Eventually Dave took over, and ended by leading the audience in a full on sing-a-long of Buffalo Springfield’s “For What It’s Worth” chorus. Side note: Similarly on N2, we all joined in for a rendition of the Doobie Brothers’ “Black Water,” which was definitely one of the highlights of the second night for me. Wedged in the middle of “Grace Is Gone,” you could see the smile on Dave’s face as we all got more and more into it. The band and the crowd were all jamming out by the time we hit the ending hoedown. I love how the band has been adding this country tease into “GIG”…really makes the song come to life. Moving onto the N1 encore…looks like it’s becoming standard for Dave to come out solo for the first tune and then have the whole band rejoin him. It’s always great when Dave is feeling a bit chatty and tonight was no exception. Telling us that he’s been spending some free time at a guitar school, he explained that he picked up this “funny looking guitar and this is what came out”…a.k.a. the song more formally known as “Corn Bread.” The guitar was definitely a little bizarre looking, and I believe it was a Steele one, but I’m no guitar expert so please correct me if I’m wrong. And according to Dave, it’s the only song he can play on it...though I'm sure we all doubt that! I remember hearing and really loving this new tune back at the D&T Radio City show. It’s a funky, down-home Southern-ey kinda song that’s got a little dirty/sexiness going on too. It sounded even better and fuller the next night when some of the other guys joined Dave on stage for it, I believe Butch and Carter. “Two Step” is always a powerful closer, and as soon as the crowd hears Boyd hit the first notes, everyone goes nuts. Once again, Carter closed the night with a ridiculous drumming display that no doubt puts him in a class of his own. If you keep an eye on him, you’re likely to see some of those drumsticks he throws out at the end of the night flying out of his hands mid jam. Overall, Mansfield was a great way to kick off the tour! Great review, and i am sure an amazing show. So I am not sure if I read this right, but you are a DMB fan????? You sure do have a great job! Every summer I wish i lived on the east coast to see the kickoff of dmb's summer tour, but I am flying to deer creek in a week and a half....the wait will be over. Thanks for the write up. Awesome review! Sounds like it was a great show! I am soooo jealous!!! Looks like it was another amazing concert, and I'm glad you're having such an exciting summer! DMB....hmm..could that be Dave Matthews. Is there any place you haven't seen him? You have to be one of his greatest fans...GREAT REVIEW. Glad you enjoyed the dirty sexiness of Cornbread. Great review! AWESOME!! 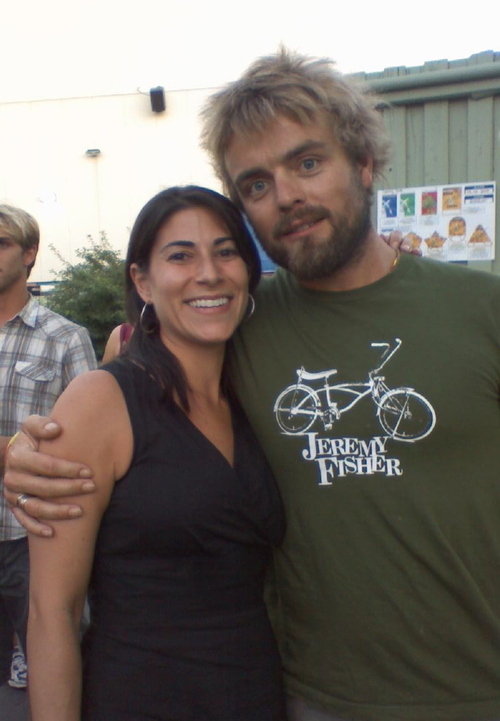 Once again you are the luckiest girl Leslie! Such a great review, and your boy Xavier came out! Again, I am jealous...but so siked for you and all of our friends who got to kick off tour last week! Cant wait to see you at SPAC!!!!!! And yes...Dave was looking at you in the front row =) I saw the pic to prove it! WOW! Sounds like you had a great time. You do a great job at capturing every little detail in your blog. Billboard should hire you full time, cause you have serious talent. As a DMB fan myself I have to say I am very jealous of your job. I admire your love for DMD too! I can't believe it was your first tour kick-off. How fun and exciting fo you! Once again, a descrptive and detailed review. Wish I was there cause it sounds like a blast! What a solid and true fan you are. awesome review. You are a natural at this..
What I would relly love is if you could make me a mix of your favorite DMB songs! You have converted me into a DMB fan. So great Les! I cant wait to experience Dave with you in VA this weekend!! Rock on! Great review, Leslie! Yet another incredible review Leslie! Felt like I was there all over again. Billboard may just be offering you a full time job at the end of the summer! I so enjoyed your review of the DMB show in Chicago, which I attended, that I wondered could you match it with the same feeling and intensity. You absolutely did, you took me there even though I didn't attend. Your review has totally got me jonesin' for Saturday's concert in Virginia! Another great review, thanks for sharing your passion. Great midday break - if we can't be there at least we can experience it through your coverage...thanks! Sounds awesome! It doesn't seem like you were very far from the stage anyway! Not surprised that you enjoyed it! Great stuff! Another great review.I am not a DMB fan, but your enthusiasm is enough to make me read your entire review, with alacrity! Another golden review! Looking SO forward to my first concert experience with you this weekend (of the season that is)! First Dave and now Xavier. Where does that leave me??? Wow -- DMB at the Tweeter Center! I've been there before but never got the chance to see them. Sounds like another great show! Sooo excited for the Aug. 17th and 18th shows in Indianapolis now. It looks like they have started with great setlists with a bunch of both old and new songs. I've been to 32 shows myself, and it's looking like a strong start to a tour! Great review!!!! Nice review. I guess I'll have to re-live the experiece through the reviews, as I don't get invited to those good seats you always get your hands on!